Offering pleasant year-round weather and a beautiful natural environment, San Diego is popular place for families to live and visit. If you are in San Diego and looking for family activities on a tight budget, take advantage of many free area attractions and activities. San Diego features a wide variety of fun indoor and outdoor recreational and cultural learning activities in many scenic settings. Situated in between mountains, the Pacific Ocean and a desert, San Diego is a nature lover's paradise. If you're planning a trip there with your family, prepare to spend a lot of time outdoors enjoying several different types of activities at free area parks and beaches. Plan a family picnic that includes flying a kite or sailing a model boat at the largest manmade aquatic park in the world, Mission Bay Park. Alternatively, plan an evening picnic outing, complete with stargazing, at Balboa Park. This central city park offers free telescope use outside the Reuben H. Fleet Science Center on the first Wednesday night of each month. Organize a peaceful family outing one afternoon at one of the park's seven gardens that offer free admission. San Diego has dozens of free public beaches that offer a perfect background for a family afternoon in the sun. Play beach volleyball at one of San Diego's most prized beaches, Coronado Beach. Families with adventurous children can explore the tide pools and look for migrating whales there as well. If surfing is more up your teen's alley, go to Harbor Beach, located near the Oceanside Community. You can take advantage of great fishing opportunities at Harbor Beach, too. Collect sand dollars, watch crabs walk across the sand and learn about the natural ecosystem of the area at Torrey Pines State Natural Reserve. Mission Bay Park also features more than 20 miles of shoreline and shaded trails. Bikers, skate boarders and roller bladers can enjoy the 3-mile Mission Beach Boardwalk, which is located between Pacific and Mission Beaches. Avid hikers and mountain bikers can choose from more than 20 miles of natural tails at Mission Trails Regional Park. If you want to stay inside or experience the arts, choose from many San Diego family activities. San Diego residents and active military personnel can take advantage of free admission to select museums in Balboa Park every Tuesday. While you're there, walk around to check out the park's Spanish Colonial Revival architecture, and plan a Sunday visit to hear a free concert at the park's organ pavilion on one of the world's largest pipe organs. Learn about San Diego's history at Old Town, a free public area that features a blacksmith house and the city's oldest schoolhouse. It doesn't cost a penny to take your family to some San Diego's most popular areas. The downtown area has the historic Gaslamp Quarter, which features art galleries and boutique shops. Stroll a little farther down to the marina area, and watch the ships come in San Diego Bay. 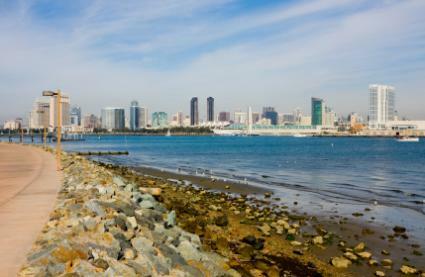 Use your creativity when planning a family day to San Diego. You don't have to spend a lot of money to do fun family activities. Visit the San Diego Convention and Visitors' Bureau and San Diego Coast Life websites to download money-saving coupons and learn about free upcoming events and activities that can become outdoor fun for your family.